We all know that choosing the correct perf for a job is critical and should be based on the product’s end use. We run in to trouble because it is easy to overlook the numerous variables that affect the strength and performance of a perforation. A change in just one variable can make or break the job. In the case of our example, the variable that changed was the paper path through a new printer. Sometimes too, the end user's idea of a perf specification is incomplete. For instance, specifying a 10tpi (teeth per inch) perf is not enough info. The tie width (or space between the perf teeth) is also needed. A little background on perforating will clarify why such little changes have such a big impact and why certain assumptions can get you in hot water. The strength of paper is commonly measured using industry standard ‘burst strength’ tests. Burst strength in very basic terms is the amount of pressure needed to rupture a sheet of paper. Perforations are also classified by ‘tear strength’ which measures the resistance to tearing at the perf. 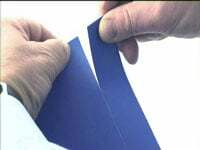 When you perforate a sheet of paper, you are partially cutting the sheet so you are reducing the burst strength. The strength of any given perf configuration is usually expressed as “TPI X Tie Width = Percent of Hold.” For instance, an 8tpi X .032” tie = .256 or 25.6% of hold. Changing the tie to .018” gives you a perf with 14.4% of hold, substantially less even though it’s the same tpi. But a 32tpi X .008” tie also has a 25.6% percent of hold, so it’s essentially the same strength as the first 8tpi, even though finer micro perfs are often thought of as being weaker than a coarse perf. The tear strength of this 32tpi however is about 1/4 the tear strength of the 8tpi X .032 perf since the tie is about 1/4 the size. Put another way, the 32tpi is just as strong (same burst strength) but much easier to tear. So now that we’ve totally complicated matters, we’re back to the question of how to determine the correct perf for the job. If there is a history to the job, it makes sense to start with experience and repeat what worked before and test it if anything is modified. If you’re starting from scratch, testing will determine what is best for the job. It pays to keep an eye on the variables and perhaps ask your customer to do the same! Be sure to check out our Micro Perforating FAQ section and Micro Perforating Tools while you’re here. We also have our Multi-Tools and CP Applicators that can do 2 Perfs at once with adjustable spacing options. All of our Perforating Tools come with a wide variety of Blade Options, some models with a range from 8 TPI thru 72 TPI. Be sure to contact Gina or Sharon at 973-383-7920 with inquiries.